A new study puts a surprising twist—one might even say a double spiral—into our understanding of how corals react to ocean warming and acidification. It also offers the possibility of an early warning system for the warmth-induced bleaching events that are increasingly harming coral reefs worldwide. Coral bleaching events—when stress disrupts the partnership that benefits both corals and the algae that normally live within their tissues—occur nearly five times more frequently now than they did just four decades ago. These events have devastated large swaths of otherwise vibrant coral reef habitats, as well as the fisheries and tourism they nurture, thus threatening the $375 billion that scientists estimate healthy reefs add to the global economy each year. 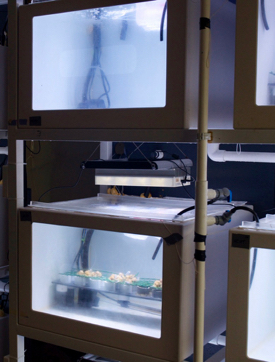 In the current study, Emily Rivest of William & Mary’s Virginia Institute of Marine Science and colleagues used a cutting-edge genomic technique to test whether ocean warming and acidification might affect the coral host differently than its algal partner. The study, published in the latest issue of Frontiers of Marine Science, was co-authored by Morgan Kelly of Louisiana State University, Melissa DeBiasse of the University of Florida, and Gretchen Hofmann of the University of California, Santa Barbara. 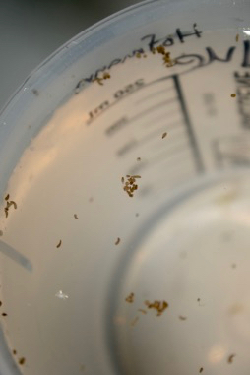 The research team proceeded by exposing one group of coral larvae and their algal symbionts to aquarium waters warmed and acidified to conditions projected for the year 2100, while holding a control group under present-day conditions of temperature and pH. They then compared how coral and algal cells from these experimental and control groups differed in terms of gene expression. Gene expression refers to the process by which a cell reads its genetic code by copying selected bits of DNA within its nucleus and using these “transcripts” to make proteins for cell growth and maintenance. In the broadest sense, gene expression is why your liver doesn’t grow eyeballs or vice versa. But for each cell type—whether liver, corneal, coral, or algal—differential expression of an organism’s genes also determines more subtle aspects of cellular structure and function such as the rate of metabolism or enzyme production. Importantly for the current study, changes in gene expression also correlate with stress. The researchers thus used these changes to gauge which cells—coral or algal—are most affected by overly warm water or corrosive acidity. To the researchers’ surprise, they found that stress alters gene expression most noticeably in the algae. Says Rivest, “We saw more differences in gene expression in the symbiont than in the coral, which was really interesting, because I think people assume that the coral—since it’s the animal and is bigger—would be the one in control and most likely to change.” The researchers discovered that 89 genes were differentially expressed in the algal cells, while only 17 were differentially expressed in the coral. Previous studies of coral bleaching have been hobbled by the technical difficulties of telling whether the genetic snippets used to gauge changes in gene expression were from the coral animal or its algal symbiont. Rivest’s team surmounted this challenge by comparing their observed snippets with those in genetic libraries recently developed for each group of organism. 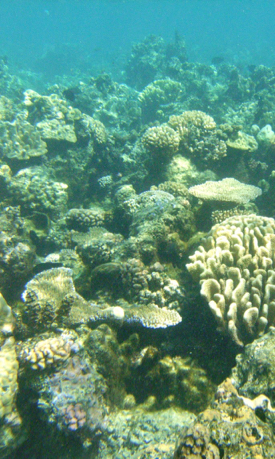 Earlier studies have also mostly focused on adult corals. By looking at larvae and their algal partners instead, Rivest’s team helped illuminate an important and vulnerable stage in a coral’s life cycle. The team’s surprise discovery has important implications for understanding, monitoring, and protecting coral reefs threatened by bleaching. “When we look for bleaching, we’re often measuring the color of the coral, which reflects the number of symbionts that are there,” says Rivest. 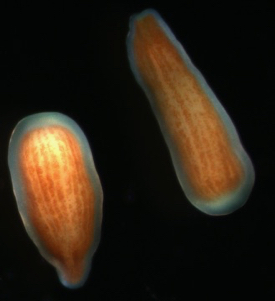 The algal symbionts contain photosynthetic pigments that give the otherwise nearly transparent coral tissues their color. When corals are stressed and lose their algae, what becomes visible is their underlying, typically whitish skeleton, giving them a bleached look. Rivest recognizes that the only truly realistic way to curtail coral bleaching is to limit the human activities that lead to ocean warming. But she thinks that an early warning system could also play a role in society’s response.